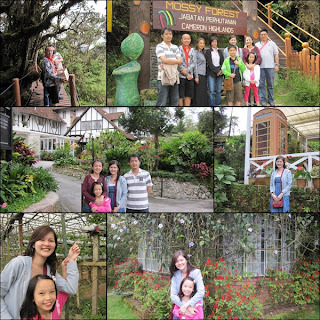 Dad has always loved cool and quiet places especially Cameron Highlands. So it came as no surprise when he specifically requested that his ashes to be scattered there when the time comes. Of course, we were hesitant as we were not sure where exactly and how to go about it. Also, the undertaker mentioned that this is A first thus they can't assist us and they only have packages for the sea/ ocean. In the end, as cousin Juanita lives there, she was more than willing to help us on this quest. After collecting his ashes Wednesday morning, we headed to Cameron, only stopping in Tapah for brunch before proceeding to meet Juanita at Tanah Rata. We have planned to stay for a night so as not to over-stressed ourselves and rushed too much. At least we have a breather. The trip was smooth sailing albeit a little land slides here and there. 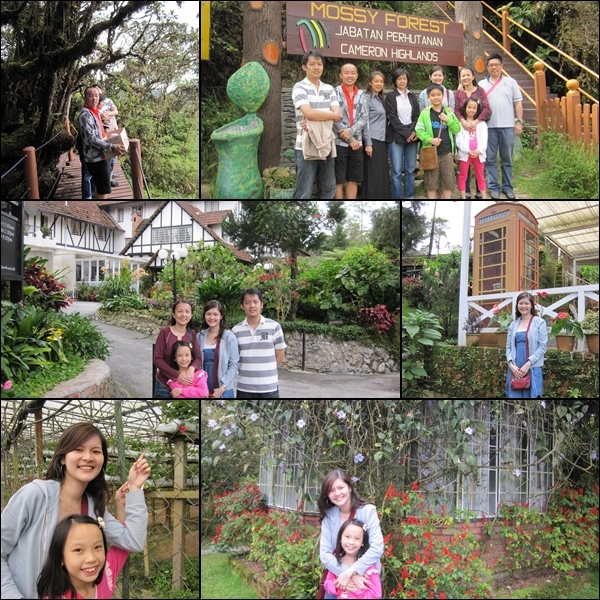 Once we have dumped our belongings and cars at the rented apartment, we boarded a hired van to Mossy Forest. Juanita always jungle-tracked here and she knew the forest very well. While on the way up Mossy Forest, it was wet and slippery as it has been raining the whole morning. Fortunately it has stopped when we were there! The funny thing was the sun actually came out when we reached that particular spot which Juanita had suggested. It was clear to us then dad wanted to be here. The scenery was beautiful, the perfect spot was serene and peaceful! After scattering dad's ashes, we headed to the market in town. It has started to rain again, heavily this time! What timing?! We dashed out to get some fruits and vegetables as we had to bring some for the next day's ceremony at Subang Jaya Buddhist Association. Of course, we stocked ourselves up with strawberries and chocolates too! Took some photos later in the evening before meeting up Juanita and family for dinner. 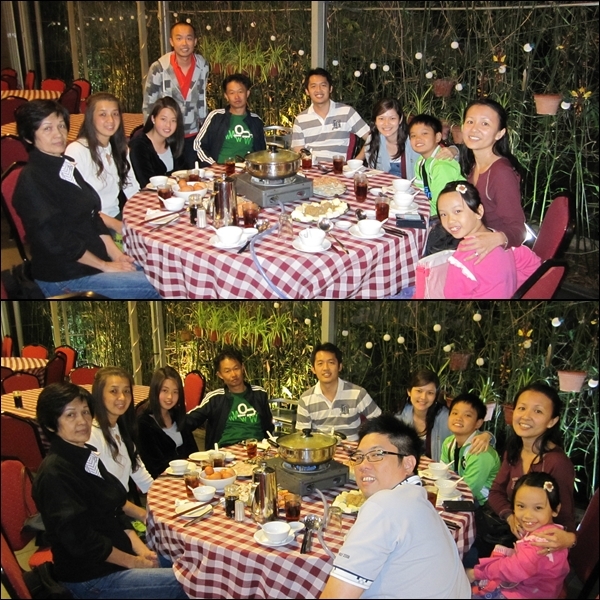 We had steamboat at one of her friend's restaurant! Can't recall the place though it was nice with warm ambiance and we were filled up to the brim! After dinner, we were adventurous since it has stopped raining. We went for a walk at the night market. Finally dropped by 1 of the mamaks for supper before heading back to the apartment. We had to rise early the next morning (mind you it was 5.30am when we left Cameron!) in order to reach Subang Jaya by 10.30am as there was a special ceremony with Sayadaw U Rewata, I think it was called 'Lunch Dana', can't recall already but it has something to do with sharing of merits and also offering Sayadaw U Rewata lunch. It may be a whirlwind trip but we actually got closer as age has created a gap between all of us. We had a good time, actually spending more quality time with each other. 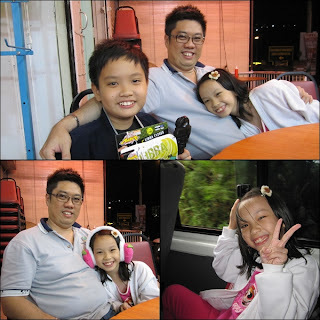 We all went home knowing we have fulfilled dad's wish and actually more. Thankfully Angels also got to have a quick holiday although a short, tiring one. I sure missed dad especially going back to the house, void of him sitting on his favourite spot... looking at his photo to call him instead of physically. Sigh! I wonder when will these melancholy feeling will subside. After the 7th day after death ceremony, I still can't believe he's not here anymore. I guess this mourning period will take a much longer time to cease. No wonder it's timed at 100 days. We are now waiting for the 49th day after death ceremony which is actually in a few days time.